Available in RED and as shown on image with the same design and tassels. It is square and each the four sides measures 30 inches. This scarf is soft and feels like real silk. It is handmade by Amazigh (Berber) women in Southeastern Morocco. These women never had a chance to go to school. We are working on helping these women by selling their art work and thank you in advance for your support! 3/4 of what you pay goes directly to these women. The scarf has beautiful vibrant colors and is ornamented with fringes and sequins. It can be worn on the head, around the neck, on the shoulders and or beautifully wear it around the waist like a belt. It makes a great gift! Have a party and order a number of these scarves in red or yellow or a mix of both. 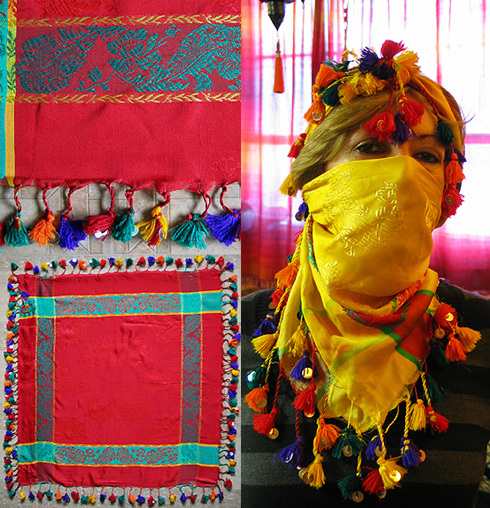 Everyone will have fun and a nice scarf to use over and over and this way we do our human share in helping these Amazigh (Berber) women continue to hand make the beautiful work they love to do. Please let us know if you would be interested in helping distribute these scarves to help these women. Thank you!